Lace Chamber is a project conceived by composer/producer Logan A. Smalley and violist/performance artist Christina Silvius. 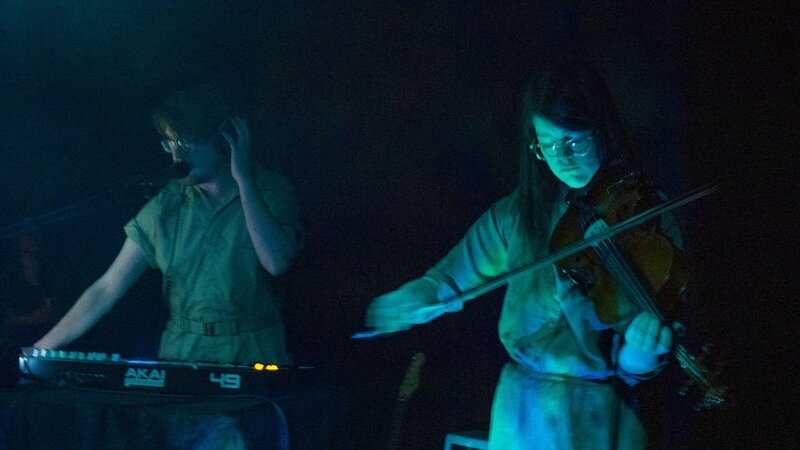 The duo incorporates elements of free improv, noise music, theatrical performance, and audience participation to create unique soundscapes that correspond with the physical environment of their performances. Logan A. Smalley was a student of music composition at The University of Missouri-Kansas City Conservatory of Music from 2011-2014, studying during this time with professors James Mobberley, Chen Yi, Zhou Long and Paul Rudy. In 2014 he left the Conservatory and began the project Lord Agave with composers Caleb Madison and Gavin Brivik performing music that ranged from psychedelic rock to electronic metal. Logan has arranged music for the men’s vocal ensemble Chanticleer, and produced electronic music that has been featured at Omaha Fashion Week. Christina Silvius graduated from the University of Missouri-Kansas City with a bachelor’s degree in studio art in 2016. She has studied with professors Barry Anderson, Hyeyoung Shin, and Jessica Borusky. She has performed at numerous art exhibitions in Kansas City including Imminent Vessel (Frontspace, 2016), Flesh Crisis: Performance Art Symposium (La Esquina, 2016), and Flesh Crisis: Pop-Up Performance Series (The Drugstore, 2017). In 2018 she performed at the ITENERANT Performance Art Festival in New York City. Christina has practiced Viola for 18 years and has studied under Laurel Morgan Parks. She is currently a member of the indie rock band Mild Cats. Christina and Logan have been performing as Lace Chamber since March 2018 and have performed in venues ranging from DIY house shows to art galleries and burlesque theaters. They were invited to perform at the Oh My Ears New Music Festival in Phoenix, Arizona in January 2019.